Shiloh spaceport study gets underway, but is it too late for SpaceX? This is a big week for those who both support and oppose plans to develop a commercial launch complex north of the Kennedy Space Center in Florida. 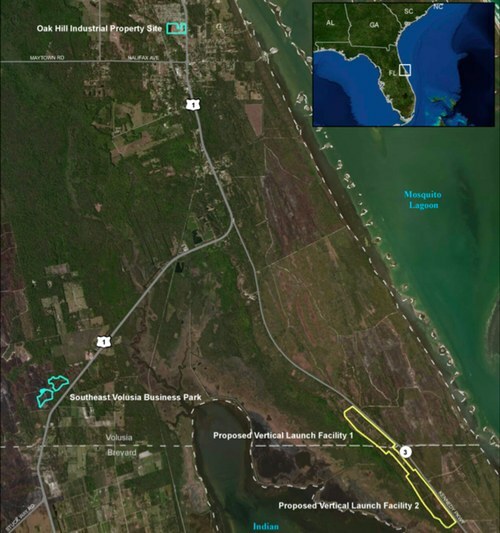 On Tuesday and Wednesday evening, the FAA’s Office of Commercial Space Transportation will hold “scoping” meetings for a planned Environmental Impact Study (EIS) for what’s known as the Shiloh Launch Complex, named after a former community at the site. The proposed commercial launch site would feature two pads on the Atlantic coast straddling the boundary between Brevard and Volusia counties, a short distance north of KSC, as well as a business park and industrial site. Each pad would be designed to accommodate 12 launches and an equal number of static fire tests per year. The public hearings—in the city of New Smyrna Beach on Tuesday and Titusville on Wednesday—are intended to solicit input from the community about what should be included in the EIS. That study will get underway later this year and will likely be the critical factor in the request by Space Florida, the state space development organization, for a spaceport license for the facility; without the license, or even with a license that contains sharp restrictions on operations based on the outcome of the EIS, the Shiloh facility may not be built at all. The proposed Shiloh Launch Complex has aroused interest, and concerns, from the local community. Space Florida and space industry backers see the site as critical to attracting commercial launch activity without the restrictions and overhad of operating at KSC or the Cape Canaveral Air Force Station; supporters plan to attend the hearings wearing red. Critics, though, worry about the facility’s potential negative impact on local wildlife, access to public beaches and wildlife preserves, and even the ruins of a 18th century British sugar plantation. Those concerns are described in detail in an article in Sunday’s Daytona Beach News-Journal. The official documents about the Shiloh launch site don’t mention a specific customer; instead, the launch pads and associated facilities are designed for “liquid fueled, medium- to heavy-lift class orbital and suborbital launch vehicles.” However, it’s widely believed that the anchor customer for this facility—if it’s built—would be SpaceX, given that company’s long-standing desire for a commercial launch facility separate from the pads it leases at Cape Canaveral and California’s Vandenberg Air Force Base. Florida, though, isn’t the only state pursuing SpaceX, and the Sunshine State’s bid could be clouded out by Texas. SpaceX has been quietly buying land at a site on the coast of the Gulf of Mexico east of Brownsville, just a few kilometers north of the Mexican border. SpaceX CEO Elon Musk has said on a number of occasions, including a talk last March, that Brownsville was the leading candidate for SpaceX’s planned new commercial spaceport. That decision could be coming soon, which may be bad news for Shiloh’s supporters. The Brownsville Herald reported last month that the EIS for the Texas site should be completed and released to the public by “late winter.” Since the EIS has traditionally been the “long pole” in any spaceport licensing decision, the release may mean a license could soon follow, long before Shiloh’s EIS is complete. If SpaceX wants to make a decision in the near term about a spaceport site, that would favor Brownsville, provided other factors, including economic incentives provided by state and local governments, come together.